a rally in Onitsha on Monday. While addressing the rally, President-General of the traders association, Mr Sunday Obinze, said that Obiano had provided enabling environment in the last four years for trade and commerce to thrive. Obinze said that Obiano had also put adequate security measures in place to guarantee safety of lives and property of traders, investors and visitors to the state. “We have absolute confidence that Obiano will in the next four years. touch on all other grey areas he was unable to touch within the first tenure. “He has for the first time since the creation of the state, involved traders in the scheme of things,” he said. Also speaking, Mr Anthony Chiloli, Chairman of UBA Plank and Joint Association (UPJA), said it would be detrimental for the state to return to politics of “god-fatherism”. “We don’t want to return to god-fatherism era and we don’t want our market and property to be set ablaze again. 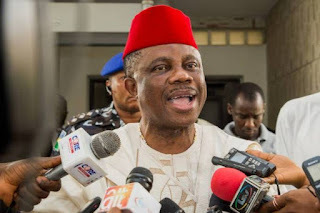 “We are ready to swim and sink with Obiano in the Nov. 18 election,” he said. In his speech, Mr Ignatius Ejike, Chairman of God’s Favour Building Materials Dealers Association, said their support was also based on the fair principle of zoning in the state. According to him, allowing Obiano to complete his two tenures will enhance development of Anambra North Senatorial zone which had been neglected over the years. “This will further sustain peace and unity and reduce waste of money and energy during elections in the state,” he added. Others who spoke at the occasion advised candidates of other political parties contesting the election not to waste their money and time for electioneering as Obiano was preferred.